with Lantra to ensure that qualifications are current and reflective of the industry’s needs. Initially the NRoSO (National Register of Sprayer Operators) system did everything that was required by City & Guilds Land Based Services. In time, however, the business grew and far more functionality was required. Although the new features were to be a series of enhancements as opposed to a complete new system the work was approached in the same manner as would be used for a complete new project. The client documented their requirements, we held design meetings to discuss those requirements and then Acumen produced a detailed specification of the work that was to be carried out. The specification was approved and a delivery deadline set (and met). The enhancements included a major overhaul of the way the events were entered and attendee registration confirmed, a revamp to the telephone call handling routine, a new enquiries section, and complete new finance section and numerous new and modified reports. 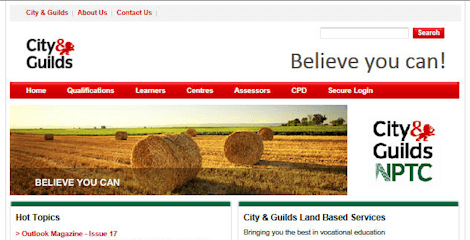 City & Guilds Land Based Services has worked with Acumen for a number of years. They offer support for two of our bespoke in-house systems and we have always found them to be extremely efficient and supportive. Our business is changing all the time and they have always found suitable solutions to help develop our system to meet these challenging requests. 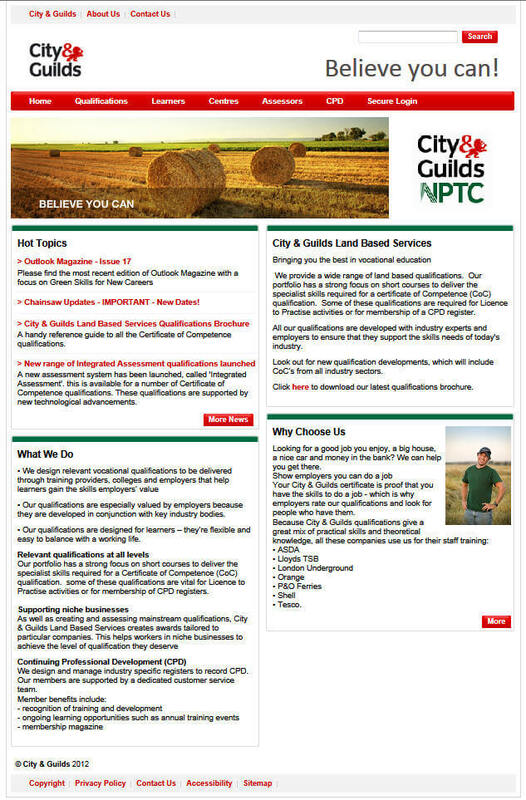 As had been the case with NRoSO, CGLBS had an existing NPTC website that had been developed many years ago (prior to Acumen’s involvement). CGLBS’s thinking behind the NRoSO website project was ‘we need to update the site and add some new functionality’ whereas for the NPTC website CGLBS knew that a complete re-design was the order of the day. 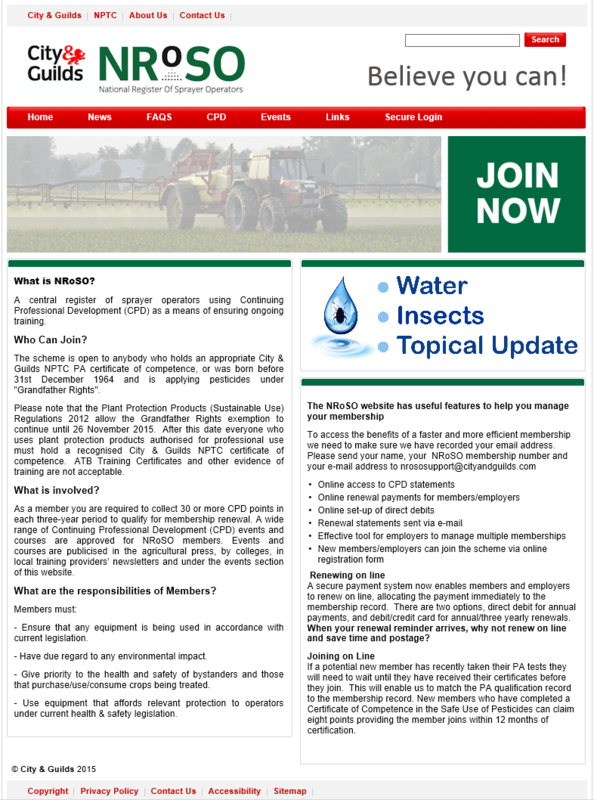 The new website not only had to look much better than the old website, it was also going to be much much bigger and offer far more information to the numerous groups of users – Learners, Centres, Assessors and Trainers. The secure area for Centres, Assessors and Trainers would offer differing content dependent on the currently logged in user’s permissions. 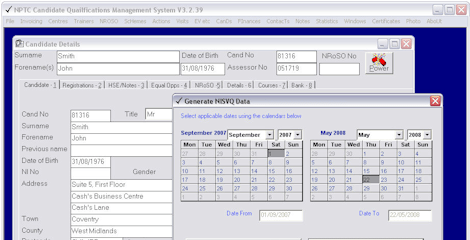 Not only would a Centre user see different information to an Assessor or a Trainer but the information displayed to one Centre would be different to the information displayed to another Centre due to settings relating to each Centre. A similar situation would apply to Assessors and Trainers. The production of the specification document highlighted many issues that hadn’t initially been considered by the client; this resulted in numerous changes to the specification before it was finally signed off. Proof again that spending time producing a detailed specification is time well spent. When the software was delivered it did exactly what the client wanted. The ‘peculiar situations that only occur occasionally’ had already been taken into consideration and the software was ready for them when they did occur. 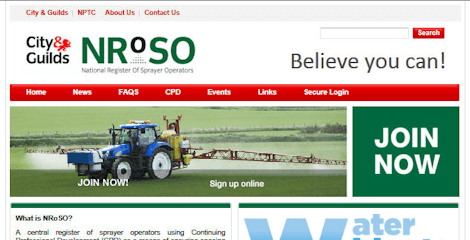 CGLBS had an existing NRoSO website that had been developed many years ago (prior to Acumen’s involvement) that was looking dated and no longer matched the corporate branding. CGLBS also wanted a host of new functionality. The website had been developed in an old version of .NET (2003) so it was initially thought that we may be able to upgrade the source code to Visual Studio 2010. Unfortunately CGLBS were unable to obtain the source code from the original supplier. In retrospect the changes that CGLBS wanted were so fundamental that a complete re-design was the only way forward. Using the old website as a reference point we produced a specification that documented everything that was good about the old site together with all the new functionality that was required. The key new features being the ability for members and their employers to view their Continual Professional Development (CPD) records and to submit new direct debit mandate requests or to make payment by debit/credit card. The website architectural design that Acumen implemented, means that other City & Guilds websites can be more easily developed from this to maintain the corporate look and feel using minimal coding for a cost effective solution – a winning solution. 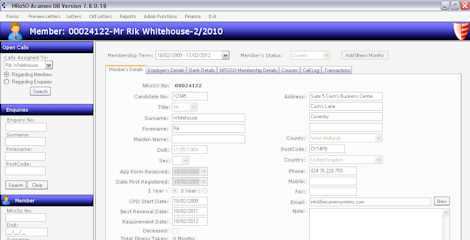 At the time of re-developing the NRoSO website it was already known that CGLBS had at least one other area of business for which a website would be required. 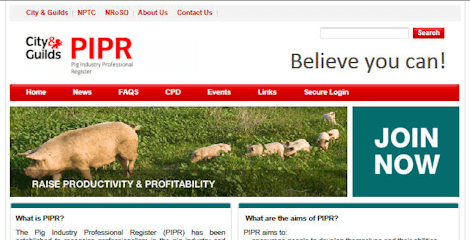 The PIPR scheme is almost the same, from a business perspective, as the NRoSO scheme. The architectural design that Acumen implemented for the NRoSO website meant that with a minimal amount of effort we could completely re-brand the NRoSO website as the PIPR website. Parameters allow us to turn on or off certain areas of the website dependent upon the scheme. All that CGLBS had to do was use the content management system to change the page content. By using parameters to control key aspects of the website Acumen has been able maintain a single copy of the source code. This means that changes don’t have to be done twice. From Acumen’s perspective this is less of a headache. From the customers perspective the support cost overhead is reduced. 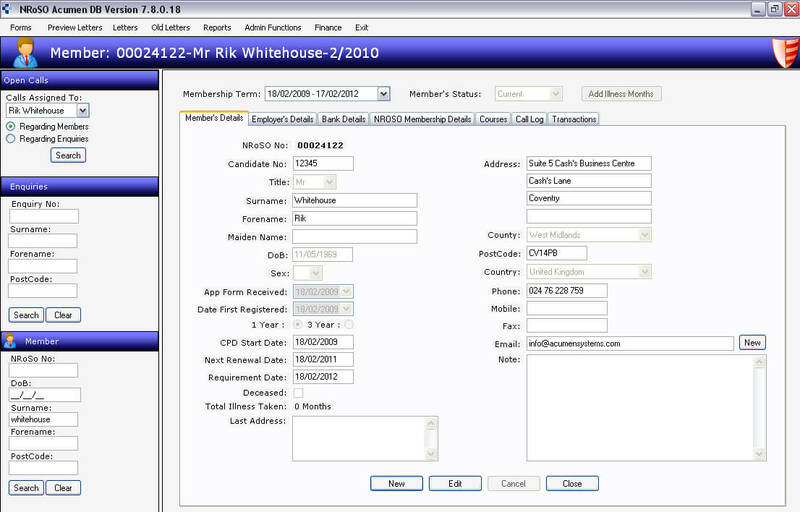 The NRoSO desktop system hadn’t originally been designed with cloned versions in mind so configuring the system to allow such cloning was a little more involved than starting from scratch (as was the case with the website). Acumen performed an analysis of the existing system and then supplied a specification change document for all the areas that would need to be amended in order to allow simple re-branding. 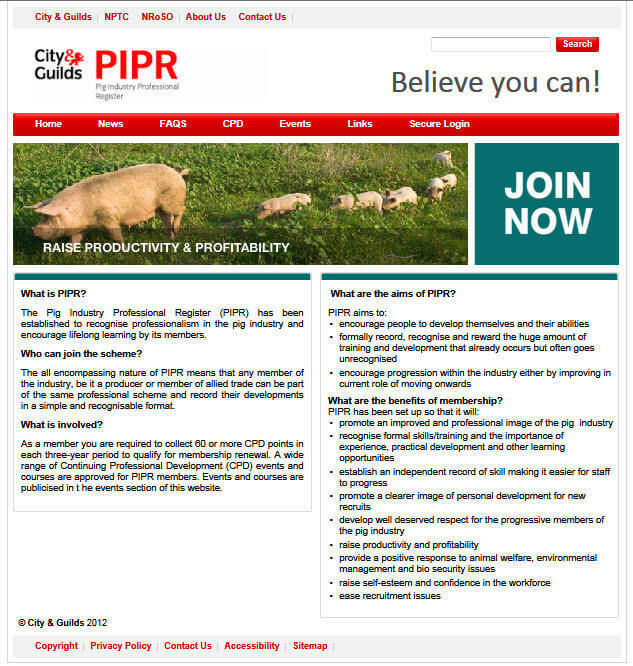 Like the website the desktop client can now be re-branded for new schemes with minimal effort. CQMS has had numerous enhancements to different areas of the application since we started working with City & Guilds Land Based Services. All of this has involved Acumen dealing with various departments and people both at City & Guilds Land Based Services headquarters in Stareton and at City & Guilds in London. 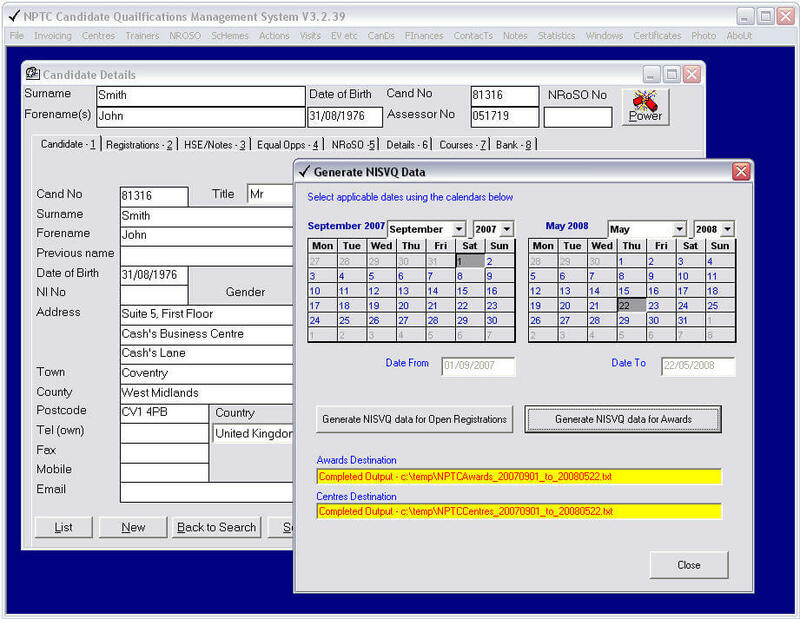 Most recently the Department for Education and Skills has requested that City & Guilds Land Based Services provide NISVQ (National Information System for Vocational Qualifications) data and this has been achieved by the addition of a new data exporting routine.